Behind a pair of goals by senior Ahti Oksanen and another strong goaltending performance by senior Sean Maguire, #11 Terriers won the first half of the home-and-home series with Maine, 5-2, at Alfond Arena in Orono. The Finnish winger and his linemates, senior Matt Lane and freshman Jordan Greenway combined for six points, and BU also received goals from captain Matt Grzelcyk, senior Mike Moran and freshman Jakob Forsbacka Karlsson. The teams came out firing with a combined 28 shots in the first period, but BU scored the only goal when Grzelcyk’s shot from the point sailed past goalie Matt Morris who was screened by Forsbacka Karlsson. Grzelcyk now has eight goals in just 11 games. Early in the second, Greenway outmuscled Maine defenders behind the Black Bears’ cage and slid the puck across the crease to Oksanen for a tap-in goal. The home team responded two minutes later on a power play when Cam Brown got behind the BU defense and put a backhander past Maguire. Midway through the period some pretty passing by Greenway and Oksanen sent the puck to Moran in the slot. He kicked the puck to his stick and backhanded a shot past Morris for his first goal of the season. Less than a minute into the third period Forsbacka Karlsson found the rebound of a Brandon Fortunato shot and converted it for his seventh goal of the season for a 4-1 lead. Late in the period, Blaine Byron popped home a rebound with just two seconds left on a Maine power play. Oksanen followed with his team-high 13th goal, aided by Greenway’s third assist of the game. “Those are big, NHL bodies [and] don’t get me wrong, they have stick skills, too, but if they’re moving their feet it’s going to be very difficult for anyone to defend them." Maguire turned aside 32 Maine shots including a few point blank attempts as Maine generated numerous grade A chances. Once again, Greenway was a force along the boards and behind the Maine net in a grinding game that suits his style. The 6-5 wing from Potsdam, N.Y., who had just two points in his first 13 games, has tallied two goals and nine assists in the last ten games. 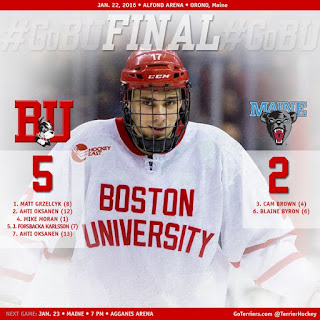 BU’s fourth line pressured Maine all night. In addition to Moran’s goal, junior Tommy Kelley had five shots. 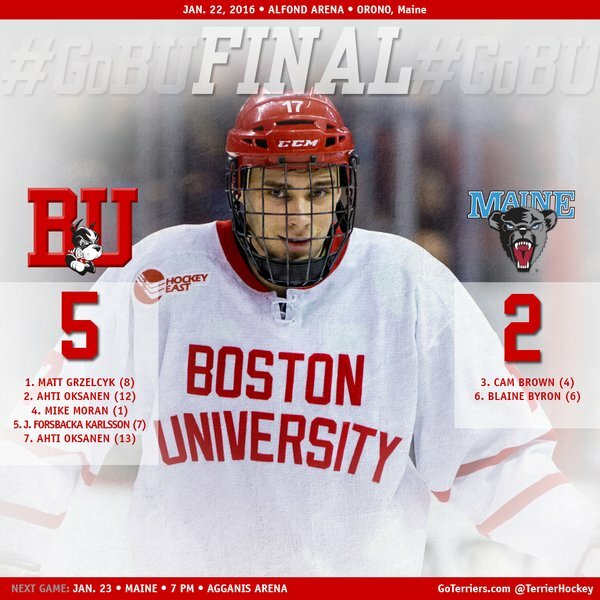 For the first time since the late '80s, BU has a winning record at Alfond Arena— (24-23-7). 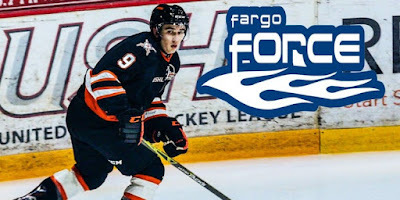 The teams conclude the series tonight at Agganis Arena with puck drop at 7 p.m.
2017 recruit Hank Crone scored a goal and added two power play assists for Fargo as the Force blanked Waterloo, 6-0. 2016 recruit Dante Fabbro assisted on a pair of Penticton goals as the Vees throttled Chilliwack, 8-1. The right-shot defenseman who is projected to be a first round pick in the upcoming NHL entry draft, has 48 points this season, including 16 multi-point games. Wade Megan’s fifth goal of the season was the game-winner as AHL Portland edged Wilkes Barre/Scranton, 2-1. Evan Rodrigues scored his fifth goal of the season in Rochester’s 5-3 win over Grand Rapids. 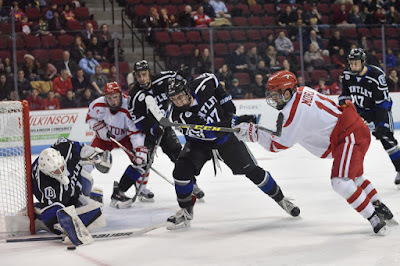 Terriers resume conference play with a home-and-home series against Providence. Today, BU hosts the Friars in a game at Agganis Arena beginning at 3 p.m. Last month, the Terriers blanked Providence, 6-0, at Schneider Arena. Sophomores Rebecca Leslie and Victoria Bach lead BU with 31 and 28 points respectively. Senior Sarah Lefort has 26 and senior Rebecca Russo has 23. 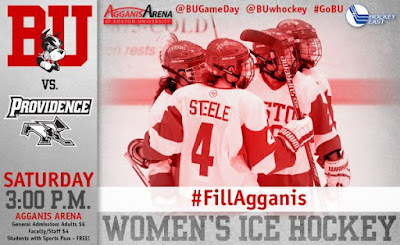 ●GoTerriers.com preview, Game Notes, Live Stats, Terrier TV.